Our compassionate family dental team is committed to helping your child enjoy a positive experience to reduce any anxiety or fear that they may be encountering. At your child’s first appointment, we’ll focus on creating a familiarity with the practice and review specific concerns that you may have. If treatment is necessary, we can discuss which options are available and arrange a care plan that fits your schedule, budget and immediate needs. …as well as restorative fillings, crowns and pulp therapy to treat active dental disease. 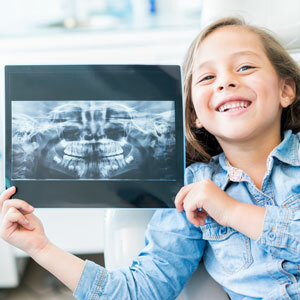 As young as 7 years of age, we can detect growth irregularities in your child’s jaw and tooth eruption patterns that, if not intercepted, can lead to complex orthodontic concerns later on. Early growth modification and orthodontic appliances can facilitate proper orofacial development as your child matures. Is your son or daughter involved in athletic activities? Dental injuries such as broken or knocked out teeth, lip lacerations and concussions are some of the most common emergencies affecting child athletes. We offer custom mouth guard fabrication for the best protection possible. Our athletic guards fit more comfortably and securely than any product available over the counter. Families who receive CDBS benefits are entitled to up to $1,000 in dental services per child (ages 2-17), over the course of two years. Qualifying services include basic cleans, exams, fissure sealants, tooth coloured fillings, root canals and more. Contact us today to book your child or family’s next visit with us. We’re open on Saturdays!